Written by one of the premier psychiatry departments in the world, this "gold standard" on consultation liaison psychiatry offers expert guidance on diagnosing and treating the psychiatric problems of the in-hospital, medically ill patient. It features practical advice on how to manage both adults and children who are coping with life-threatening illnesses, chronic disease, disfigurement, and more. 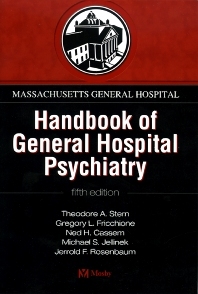 Readers will also find advice on commonly found but difficult to manage problems such as depression, anxiety, and delirium. Features the expertise of clinicians, teachers, and researchers from Massachusetts General Hospital. Provides cognitive and behavioral strategies that practitioners at all levels can use. Presents practical guidance on drugs and their side effects, along with recommendations for alternative drug therapies. Discusses how to manage difficult, hypochondriacal, and somatoform and conversion patients. 25. Psychopharmacology for Children and Adolescents.